After some years of investment reduction, the canning industry strikes back on R&D activity looking for new food formula and new presentations. The packaging manufacturers are also encouraging the development and the transition to alternative containers which offer numerous benefits with respect to traditional metal or glass cans. Although Marketing may be driver number one, cost and environmental reasons run right behind. Special mention deserves the carton package developed by Tetra Recart, a Tetra Pak company, growing as a strong alternative to the round can. Tomato, vegetables, beans, soups, petfood, to mention a few are products that stand out in the supermarket, shelfs worldwide with attractively designed facing. 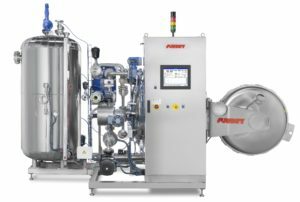 Surdry pilot retorts are the perfect tool for testing and market probing of all these new foods and packages where sterilization takes place after filling and sealing the container hermetically. The range of equipment include them all from simple static models up to the more sophisticated multimode process or agitation modes. Simulation tools to migrate between process technologies or to transition towards new Surdry continuous equipment are readily available or custom made. The latest versions are designed to minimize installation time. 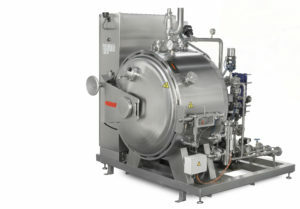 There are equipped with all utility filtering and monitoring instruments, finishing at a line of flanges where steam, water or air, as well as drain and exhaust pipes are quickly and easily connected in a matter of a few hours. Fully tested before shipping, the Surdry pilot retorts can be ready to operate during the same day after receiving at customer’s facilities. No steam or compressed air available at the R&D room is not a show stopper any more. Upon request, our pilot retorts can be married to a Surdry Power Pack unit, which includes a gas or electric steam generator, air compressor and a water tank.